Art in the Age is selling Maplejack, a limited batch apple brandy that uses locally sourced maple syrup. Are you one of the people already consuming pumpkin spice lattes? If so, you may be interested in Art in the Age's slightly more adult way to toast (a week early) to the start of autumn. 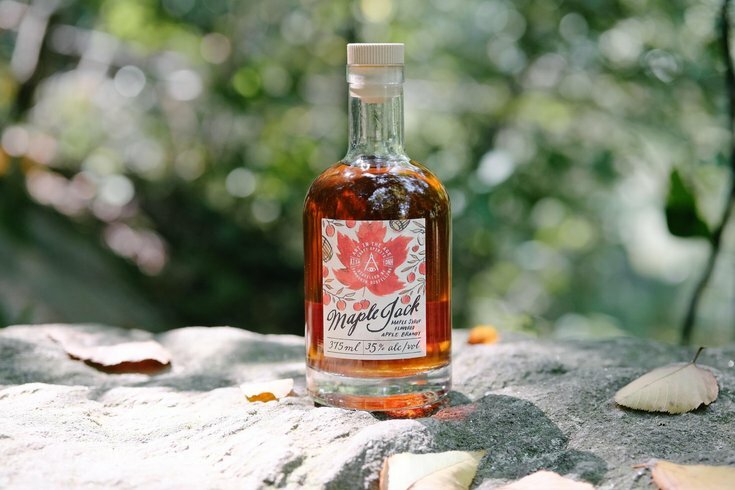 This week, the Old City boutique began selling Maplejack, an apple brandy from Quaker City Mercantile that mingles locally sourced maple syrup with New Hampshire apple brandy from Tamworth Distilling. The brandy is perfect for those craving apple cider with a kick. The combination also brings out some of the brandy's natural sweetness, making for a suitable solo sipper or perfect for festive fall cocktails. The batch is being sold in 375ml bottles at Art in the Age for $49.99. Only 113 bottles were made. The drink runs at 35ABV. Combine cider, Maplejack, and lemon juice in shaker filled with ice and shake. Strain into a glass. Top with maple syrup and garnish with lemon wedge. Add all ingredients in a shaker filled with ice and shake. Strain into glass filled with ice. Garnish with cherry.